Dr. David Behm is an award-winning Research Professor at the Memorial University of Newfoundland’s School of Human Kinetics and Recreation. He is the recipient of the Memorial University President’s Award for Outstanding Research (2006), Memorial University School of Graduate Studies Dean’s Award for Service Excellence (2012), National Strength and Conditioning Association Outstanding Sport Scientist award (2014) and Canadian Society for Exercise Physiology Honour Award (2015). David is also one of the most prolific researchers in the world across a broad range of interests, such as resistance training, balance, and neuromuscular responses to stretching – among many others – with over 200 peer-reviewed articles and over 11,000 citations, and he ranks within the top 2.5% of the most productive researchers in the world, according to ResearchGate. He has made many public appearances on television, radio, and on new media, in addition to being featured in mainstream newspapers and fitness magazines. With his own athletic background of having been a junior ice hockey player, being drafted into the Canadian Football League, and being a provincial champion in both Tennis and Squash, David’s interests, research, and engagement with the public are informed by his desire to bridge the gap between these worlds for everyone’s benefit. Some of you may already be familiar with or may have heard of David and his work in passing if you have a habit of keeping your ear to the ground in when it comes to HIT and health & fitness in general. Here is one of his many public appearances, where David speaks at length about stretching and athletic performance on TEDx. QUESTION(S) OF THE DAY: Have you made a habit of warming up or stretching prior to working out? What has your experience been like? Please let me know in the comments at the bottom of this post. Great one. Really likeable guy with a really listenable accent, lol. Really interested in one more question if you’re able to ask David? I was under the impression that muscles and connective tissue couldn’t really be physically “stretched” beyond their natural maximal length. 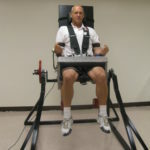 It was my reading that an individual’s limits to their range of motion were due in a large part to neurological inhibition, acting as a “safety net” to stop the body getting into dangerous positions likely to result in injury. An individual under sedation, I am told can be put into all sorts of positions at the extremes of ROM and joint function due to the removal of that neurological inhibition. Is there any truth to what I’ve read? I was fascinated by the discussion of nerve conduction velocity in regard to orderly recruitment of motor units, don’t let Andy Galpin hear though or he’ll have us all p*ssing fast…! Seriously though I’d be interested in knowing if unique positive adaptations result from those higher hertz nerve impulses. I was surprised and amused at the answer to my question on foam rolling. I had assumed that, as a fad, it was a load of toss but I’m always happy to be corrected! Definitely chuckling at the second part of the answer though, not very surprised by the lack of evidence for self myofascial release but very surprised by the actual proposed mechanism! Glad you enjoyed it Andrew. It was a technical one indeed but I know you love that ;-). I’ll ask David to comment but can’t promise. No worries if not, thanks either way! Glad you appreciated the accent! I have lived in most major Canadian cities, so it is a true amalgamation of Canadian and the unique Newfoundland dialects. Yes neurological inhibition plays a major role in the limits to ROM. There are definite structural limits to our flexibility. The research is conflicting about the extent to which you can change the structural properties. In animal studies, you see reports of increases of sarcomeres in series to increase the length of the muscle. There are also reports in humans of changes in muscle pennation angle, changes in cross linkages between collagen and elastin fibres, muscle fascicle length and rotation and other factors. But I would agree that neurological inhibition and stretch tolerance can lead to greater ROM increases in the short term than structural changes. However I do not believe that a gymnast who stretches for years and can pull their foot up and touch the back of their head does not have significant structural adaptations. Re: higher Hertz adaptations. Read my old article and review on the intent to contract explosively (Behm and Sale 1993). We showed high velocity training adaptations with isometric contractions that were the same as with high velocity contractions. Both groups however during their training had the intent to explode into the contractions and thus the high frequency signals coming from the brain were similar. Tanks b’y; Right on my son, you take it easy! Whaddya at? (Newfoundland dialect). Hope the response was helpful. Thank you, that was very informative. Plenty of food for thought!